Another trainride equals another opportunity for me to pen down a review for you guys. This time we're looking into the idea that, if you live in a place that's too remote to be visited by your favourite band every so often, it's okay for you to start your own band that sounds by and large the same. 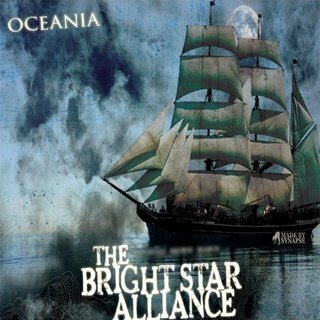 Let's face it: Most of the time the Melbourne, Australia-based screamo outfit The Bright Star Alliance grind the same gears as the kings of the genre Underoath do in order to make their debut "Oceania EP" rock. The result of this however is little more than the listener thinking "Oh well, if it ain't broken, don't fix it". Through five tracks dripping with watery ambience the band leaves little doubt as to what they're trying to do. Marauding screams duel ceremonial clean choirs, matching desperate aggresion with catchy melody and added to the mostly discordant riffage this draws the most obvious parallels to Underoath. The only difference is that I at least personally feel there's bit more of a metal edge to the expression that wouldn't leave fans of As I Lay Dying completely in the dark. The main reason I say that, in spite of the lack of originality, there's little to fix about this EP, is because of the quality and sense of purpose that seems to have gone into the Oceania EP. This is a record that knows exactly what sound and what fans it is aiming for and it goes all out after them with all the things that's been proven in the past and there is absolutely no messing around. What this means is that, if you're not exactly looking for the next screamo milestone from Underoath or Oh Sleeper themselves, this is exactly the kind of release you can pickup and enjoy immediately. So if Adept, HerBrightSkies and the other Swedish attempts at rivalling the genre-masters have been wearing your ipod out for too long now, I recommend trying out the Australian approach. Download: "Human Body, Anchor", "Staring Into Reflections, Return Nothing"